Grab your swimsuit and head for the water! Load the catamaran boat on the trailer and hitch it to the 4x4. Pack up the life vests and drive to the shore. Launch the catamaran, lift the sail and have a fun-packed day on the waves. It’s another exciting LEGO® City adventure! Price is 20% below the initial Lego retail price, a € 4.04 discount! 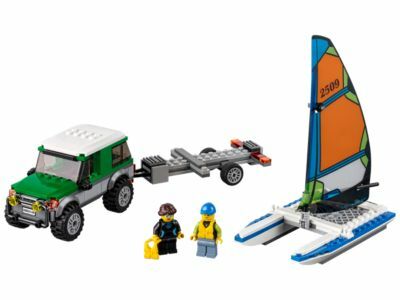 The 4x4 with Catamaran (60149) Lego set is no longer directly available from the sites below. However, 3rd party partners of these sites might still have the set available. Alternate description Head out for a sail! Includes two minifigures: a catamaran pilot and a 4x4 driver. Features a 4x4 truck, detachable trailer and a catamaran boat. Hitch the trailer to the 4x4 truck. Raise the sail on the catamaran once it’s off the trailer. Accessory elements include two life vests. 4x4 truck measures over 2” (7cm) high, 4” (12cm) long and 1” (5cm) wide. Trailer measures over 5” (15cm) long, 2” (6cm) wide and under 1” (2cm) high. Catamaran boat with upright sail measures over 7” (18cm) high, 5” (14cm) long and 3” (8cm) wide.